If you were going to start a business, it would be good to do it at home. If you have interest in designing invitation cards, then start planning for an invitation card business. This will allow you to take command of the business because it is ran from home. Many clients are in need of invitations for their special occasions. Having an invitation business at home would make it more comfortable. The right resources and the determination to build it would lead to a great benefit at all times. Being the home broker, you have the opportunity to make it successful. Time management is the most vital part in running a business from home. You have to take care of your family and personal tasks before dedicating some time for running the business. If you don’t know how to manage time, then you are at risk. You should see some of the best videos available on YouTube for managing your time and read articles on how to maintain a calendar. If you see yourself not finding any free time, then don’t plan for starting this business right away. Once you master these skills and free up yourself with some time, then roads are clear for you to proceed for your first startup. To start this business, you need to know the complete making process of an invitation card. You are not advised to hire someone to do this for you from your home, you will do all the work yourself so better get ready with all the required skillsets. Having a local permit record is essential in order to provide the security and effective approach for the business. Selling invitations is a great business so you have to make it secure in any way possible. In having a local permit, you are sure of having a successful venture ahead. You can delay the process of getting a permit if you are not too sure where you are heading with the business, but don’t forget that it is illegal to run a business without having a proper permit. In making a contract with printing companies, it would make it easy for you to print the stationeries. A printing company will be a big help in making a fast and successful manner of printing the materials required. It would make it easy for the business to distribute needed materials. The internet is very effective these days. The fast connection to the internet will make the home business grow in a fast way as possible. You also need a high-end computer with all the needed software like Photoshop, illustrator, etc. You will have to invest some money here. If you are going to start the business, it is important to request all the information from clients to get their work done with limited reviews and quick turnaround time. The right and effective catalogs will help you in order to set the right process and materials to be made. This will make sure that you will have an edge in creating invitations for most clients. Every business has the right kind of resources to make the process effective. The resources such as the stationeries and brochures make up the progress of the home based business. This will create an effective means in adding production to the client’s orders. With the right and large amount of resources, a dealer will sure hit the jackpot in the invitation business. The home-based business requires important things in order to make it successful. It will provide many benefits that would provide you with large amount of cash and savings. If you were going to be a dealer, it would be best to set the things to be considered. These pertain to the materials, the local permit, the dealers account and other required documents. The business will have success most of the time if the requirements are followed. This will provide each client with the effective means of having a high quality product of invitations. Starting any business is tough, if you have passion and energy to work on any odd hours then open a homebased invitation business. 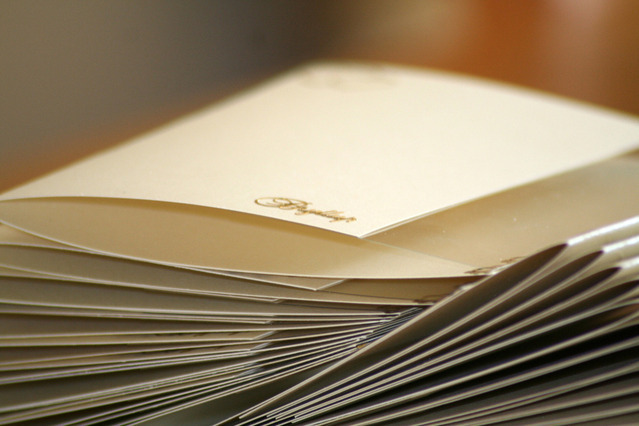 Are you good in designing and inclined to start a wedding invitation business? This business can be pulled off by just following the guidelines that you can read in this article. So read on. Are you looking for information how to start your on invitation company? Curious how you start it with out making any startup mistakes? This article will certainly be valuable to you in starting this business venture. << Can You Run a Business in a Residential Area?